When Marriott announced they were acquiring Starwood, there was tremendous consternation from Starwood Preferred Guest members. Starwood cultivated a reputation for delivering benefits and experiences members care about. Marriott was all about delivering consistency and not peak experiences. The purpose of the deal was to give Marriott greater leverage according to Bill Marriott. People initially talked about leverage with suppliers, but it was clearly also leverage with customers – hence they led the way with stricter hotel cancallation policies<?a>. Though Marriott’s approach to loyalty was historically staid, CEO Arne Sorenson emphasized to me how important it is and that he wants to offer the only loyalty program customers need. It’s how they plan to tie together 30 disparate brands (and without huge marketing budgets as well). They were quick out of the gate with status matching and points transfers, and put a Starwood executive in charge of the program. However it’s been mostly quiet on the changes front. We can expect a lot more change next year. But if we’re looking for tea leaves about what to expect, remember that Marriott has been a steady stream of devaluations for years. They removed all-inclusive rewards without notice in 2011. Last year with merger news fresh they only increased 1.5 times as many hotels as they reduced. Devaluation just seems to be in their bones on the Marriott side, and the Starwood merger and Starwood Preferred Guest leadership appear not to have changed that. While they announced a reasonable set of category changes for Starwood the changes at Marriott are absolutely brutal: 21% of hotels are going up in category while just 5% are going down in category. The number of points required to redeem for a free Marriott hotel night is going up at over 1000 hotels effective March 6th. The full list of hotels changing category is available here. Marriott consistently increases redemption prices at more hotels, and a greater percentage of hotels, than other chains. And that hasn’t changed with the merger, despite a strong desire to allay the fears of concerned members. That should tell us something. The only place where the points versus hotel rates is closer is internationally. It must be mentioned that not all category changes are equivalent. However some category changes (SPG 2 to SPG 3) are a near doubling. When using that lens to analyze this, the changes look way worse. The Mauna Kea didn’t go up thats all I care about. Transfer to your favorite airline before theyy pull a no-notice devaluation on those. My experience trying to redeem my cat 1-5 credit card free night cert for the past 5 years has been an exercise in comical frustration. I always try to use it on a trip up to Boston. And since they never make city center hotels anything below cat 8, I have to keep moving further away from the city to use it. Residence inn Norwood was the one I had to use the last 2 years since the others I used to stay at are all higher than cat 5. And now, they are raising Norwood to a cat 6 so it’s looking like I have to go to a different state to be able to use this certificate on my Boston trip next year. Or I could just cancel this stupid card. I’m thinking I won’t be the only one. Gary why are you so critical of Marriott for doing what everyone else does? Marriott top rooms are still a bargain compared to Hilton and IC which typically earn at a similar rate – but Hilton requires 95k per night for top properties, and IC just inflated to 70k, while Marriott still only requires 45k, with 5th night free? Also you always slam Hilton, Delta and others for making no-notice changes whereas Marriott is fully transparent and provides 1 month for you to book at the old rates? And finally the deval is much less than the Hilton massacre of a few years ago, or Hyatt’s recent gutting of its program. @Boraxo, you fail to understand that with Hilton, points are very easy to get. If you include bonus and a Hilton credit card you can easely get 30+ point per $1 spent on the property. 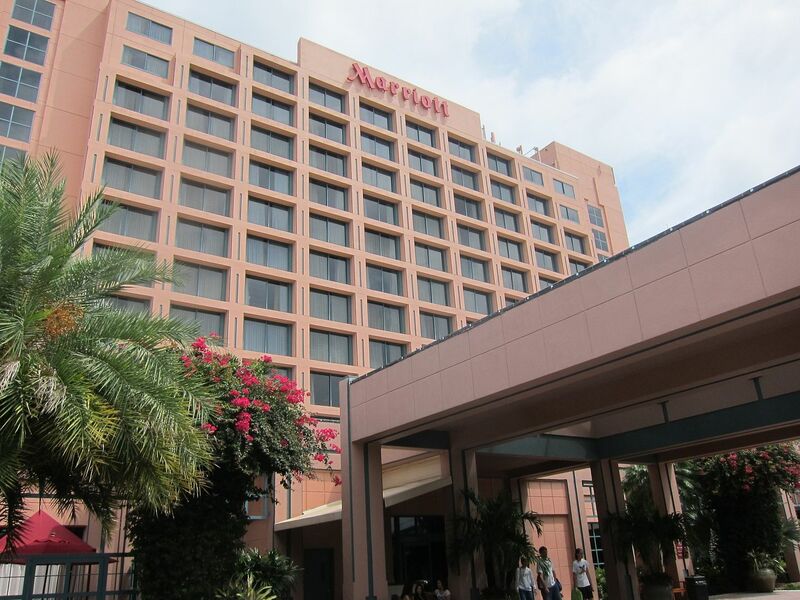 How many points/$ you get on your paid stays with Marriott? Also, non bonus spend with a Hilton card is 3 per $1 spend. Marriott? 1 per $1. So you need to spend $31666 non bonus in a hilton card to get 95000 hh points Vs $45000 on a Marriott card to get the 45000 points. Man, Orlando had SEVEN hotels bumped from the annual free night category up to Cat. 6. A silver lining is that several hotels in cities I’m planning to visit in next 18 months are now Cat. 5, including China and Spain. Unfortunately the Lisbon Marriott went from Cat 5 to Cat 6. FWIW, unless I just need an airport hotel for a layover, my practice is to use my free nights at Marriotts and Hyatts as an opportunity to stay two nights for half-price. Too bad.